We ran the Lower Arkansas River in March 2010, using our jet boat as our raft and shuttle vehicle. The beaches of the Lower Arkansas and the Mississippi Delta are spectacular, and the White River is teeming with bayou wildlife. I highly recommend these rivers. The canals and lakes of the McLellan-Kerr Navigation System were industrial and tame. Skip them unless you want to wait around to run the locks. Consider launching at Rosedale, and running up each river, then rowing and drifting down each back to your starting point. Near the Mississippi River, the White River and Arkansas River can get backed up, so rowing, especially into the wind, is extremely difficult. We used just under 30 gallons of gasoline to get up the Mississippi and back to the car, as well as for some short runs at the end of the rowing days, and for getting 6 miles up and back down the White in the wind. Wind and river volume will cause your mileage to vary. Running mid-week before the Arkansas spring break was lucky timing for us. 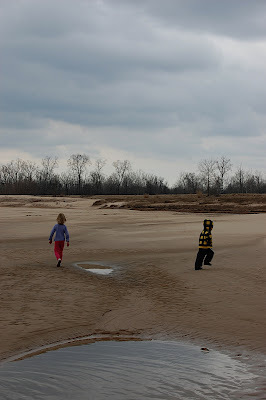 We saw nobody on the Arkansas, and very few people on the White and Mississippi. Day 1 - Row and drift down the Arkansas. Day 2 - Row and drift down to the mouth of the Arkansas. Day 3 - Motor out of the Arkansas, into the Mississippi. Motor up the Mississippi to the White River. There is a nice beach across from the White. Day 4 & 5 - Start the day with possibility of exploring further up the White, depending on timings and gasoline reserves. Drift down the White River to the confluence with the Wilbur Mills canal. Motor along the canal, back to Notrebes Bend and car. View pictures of the same adventure as captured by Neylan and Noli.